The findings, published in the journal Science Advances, highlight the need for detailed observations of Antarctic glaciers’ undersides in calculating how fast sea levels will rise in response to warming. 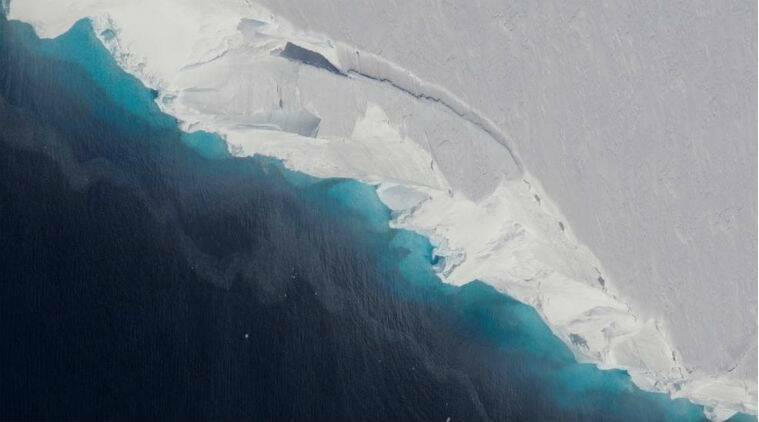 Researchers expected to find some gaps between ice and bedrock at Thwaites’ bottom where ocean water could flow in and melt the glacier from below, NASA said in a statement. The size and explosive growth rate of the newfound hole, however, surprised them. It is big enough to have contained 14 billion tonnes of ice, and most of that ice melted over the last three years. “We have suspected for years that Thwaites was not tightly attached to the bedrock beneath it,” said Eric Rignot of the University of California, Irvine in the US. “Thanks to a new generation of satellites, we can finally see the detail,” said Rignot, who is also associated with NASA’s Jet Propulsion Laboratory (JPL). The researchers also used data from a constellation of Italian and German space-borne synthetic aperture radars. These very high-resolution data can be processed by a technique called radar interferometry to reveal how the ground surface below has moved between images. “(The size of) a cavity under a glacier plays an important role in melting. As more heat and water get under the glacier, it melts faster,” said Pietro Milillo of JPL. Thwaites Glacier is currently responsible for about four per cent of global sea level rise, researchers said. It holds enough ice to raise the world ocean a little over 65 centimeters and backstops neighbouring glaciers that would raise sea levels an additional 2.4 metres if all the ice were lost, they said. “We are discovering different mechanisms of retreat,” Millilo said. The huge cavity is under the main trunk of the glacier on its western side — the side farther from the West Antarctic Peninsula. In this region, as the tide rises and falls, the grounding line retreats and advances across a zone of about three to five kilometers. “On the eastern side of the glacier, the grounding-line retreat proceeds through small channels, maybe a kilometer wide, like fingers reaching beneath the glacier to melt it from below,” Milillo said. In that region, the rate of grounding-line retreat doubled from about 0.6 kilometers a year from 1992 to 2011 to 1.2 kilometers a year from 2011 to 2017, researchers said. Even with this accelerating retreat, however, melt rates on this side of the glacier are lower than on the western side, they said.